This game is an excellent first use of WinGraph by Neil. It is straightforward to play and has a nice feel to it so that you want to try for higher scores. The first screenshot shows the ball beginning its jump to clear the oncoming barb and the second illustrates the output of the final score together with a tempting invitation to play again. Other young programmers should learn from and try to emulate this impressive, well-commented code. See the following page for a version that keeps track of the highest score. In order to compile program Roller, you will need to have downloaded Stefan Berinde`s wingraph.zip file as described in our Graphics tutorial. You should copy the unzipped wincrt.pas, wingraph.pas and winmouse.pas (from the src folder) into your program folder. (The compiled units are included in the zip file but you might as well have the source code available for reference). You should find these three files useful for your own motion graphics programs. Note that you need to compile programs that use WinGraph on a 32-bit compiler. The next page shows the code for the game updated to save your highest score. 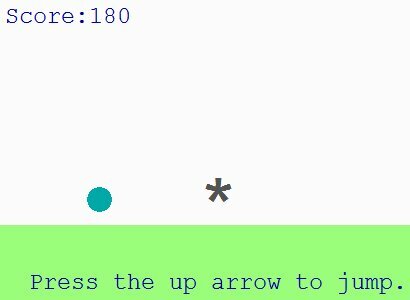 setcolor(Azure); //sets all colour to Azure because I can't find a way to specifically change the outline to Azure. BallMovement := 'down'; //122 is above 212 rather than below because the Y axis is inverted.